The hotel and gastronomic offer of Santiago de Compostela is very extensive, giving shelter to any type of pilgrim, regardless of your pocket. They say Santiago is the biggest village in the world and, at the same time the smallest city on the planet. This Galician capital combines the comforts of small locations and the advantages of large sophisticated cities. It can be crossed from one end to the other in a leisurely stroll and benefits from the amenities of large capitals. Solitary and tranquil corners and, bustling streets of wine bars all share the same stage. The historic centre, declared as a world heritage site by UNESCO, is the jewel in the crown. Constructed stone by stone around its majestic cathedral. The discovery of the tomb of the apostle in the IX century transformed this sacred place forever. 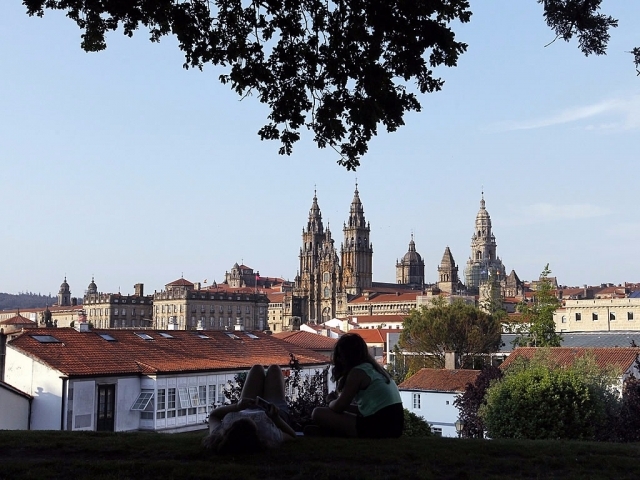 Santiago, as the capital of Galicia is seen as the benchmark of regional cuisine. To its Market of Abastos the most exquisite delicacies from the Atlantic and, the most flavoursome meats and vegetables in the planet arrive on a daily basis. The most traditional hospitality can be found on its street, particularly on calle del Franco and Raiña, close to the cathedral. The rest of its historic centre is also full of good catering establishments. Furthermore, outside its city walls there is another area where the locals can frequently be found enjoying good food and drink, namely on Rúa de San Pedro. There are also restaurants for lovers of Mediterranean, Italian, Argentinian, Japanese, Turkish and American cuisine. ¡Estoy seguro de que nadie pasará hambre!